The class browser displays a graphical outline of the class structure (focusing on the specific named class). Information about the selected class is shown in the pane on the right. The outline (which is an instance of an outline widget) can be navigated quickly by pressing the J, K, F, and D keys as alternatives to the down, up, right, and left arrow keys respectively, and the T and B keys for the Home and End keys. This works because the outline widgets in IDE tool dialogs enable their handle-home-key-shortcuts property. The browser is displayed when Tools | Browse Class is clicked. If there is a selected symbol naming a class (or if the cursor is in or next to text naming a symbol naming a class), that class is selected in the browser. Otherwise, the previously selected class or t are browsed but you can enter a class name in the Name field to browse a different class. In the illustration, we are browsing the class integer. When a class outline is generated for a class, that class is initially selected in the outline (as integer is in the illustration), but you can then click on other classes in the outline (or use the arrow keys as usual) to display information about related classes. When this is done, the class for which the outline was generated will be highlighted in the outline with a light blue background, while the selected class in the outline (for which information is displayed in the pane) will always be highlighted with the usual selection background color that you have set up in the Windows Control Panel. Pressing the main ENTER key while the outline widget has the keyboard focus will generate a new class outline for the class that is currently selected there, just as if the Tools | Browse Class command had been invoked on that class name. Right-clicking the outline will pop-up a shortcut menu of several commands from the IDE menu-bar that are likely useful for the selected class (this right-click does not select a class though), and other IDE menu-bar commands may be applicable as well. The information displayed in the pane on the right depends on which of the Feature toolbar icons is slected. Positioning the mouse over an icon will display a tooltip naming the icon (we use those names in the description below). The first seven refer to any class and the last two (P and E for Properties and Events) apply to Common Graphics-related classes. The first three choices list classes that are related to the selected class. Double-clicking or pressing ENTER on one of these classes will generate a new class outline for that class. Direct Superclasses lists the immediate superclasses of the selected class, as returned by mop:class-direct-superclasses. DirectSubclasses lists the immediate subclasses of the selected class, as returned by mop:class-direct-subclasses. Class Precedence lists all of the superclasses of the selected class, as returned by mop:class-precedence-list. The precedence order determines which methods get called, and in what order, when a generic function is called on this class. Direct Slots lists the slots that are defined by the selected class, as returned by mop:class-direct-slots. The slots are shown in alphabetical order, rather than the order in which they are defined on the class. All Slots lists both the slots defined by the selected class as well as any slots that this class inherits from superclasses, as returned by mop:class-slots. The next two choices list methods of the selected class. Double-clicking or pressing ENTER on one of these methods invokes the IDE editor on that method (if the location of its source code is known). Invoking the Run | Trace command will trace just the selected method, rather than its generic function. Invoking the Edit | Delete command will offer to remove the selected method from your lisp environment. Methods lists all methods that specialize on the selected class itself, as returned by mop:specializer-direct-methods. All Methods lists all methods that specialize on the selected class or on any of its superclasses below standard-class or structure-class. 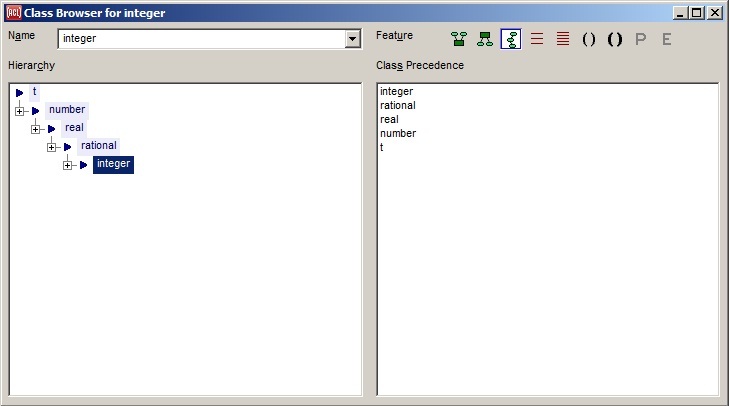 The final two choices display the properties of the selected class. In the illustration, we the combo-box class is selected and its properties are listed. These choices are enabled appear only if properties have been defined for the class by calling defproperties or defcomponent (only certain CG and IDE classes initially). Double-clicking or pressing ENTER on one of these properties will inspect the property; this may be useful for finding the names of the property-reader or property-writer functions for the property in the rare cases where these are not equal to the property name itself (and its setf). Properties lists all non-event-handler properties of the selected class, as returned by non-event-properties. Events lists all event-handler properties of the selected class, as returned by event-handlers. This page has had moderate revisions compared to the 9.0 page.